As I entered the small room where 19 women sat around, I saw Luisa and Gloria counting money that they were collecting from the group. Relying only on the external sunlight shining through the front door, Luisa and Gloria were deeply focused on their task, so much so that when we entered, they barely noticed. Near the city of Tecpán in south central Guatemala, on the southern border line of Chichicastenango, our partner the Asociación de Mujeres Ixpiyakok (ADEMI) took me to the community of Agua Viva to visit one of their member groups, an Indigenous Mayan K’iche group called Las Artesanas (The Artisans). The women have been meeting weekly since 2015 to form a savings and credits group. ADEMI shared with me that Las Artesanas was one of 50 women and savings groups they worked with in Chichicastenango and Chimaltenango. I was invited to observe and learn from Las Artesanas, where I learned that Luisa was responsible for the group’s financial registry and Gloria was responsible for updating each member’s savings booklet, which they all kept to track their weekly savings. The collective savings was used as a pool of funds to give small loans out to the group members. The group had jointly decided on the loan interest, which ultimately has helped to increase their savings fund. 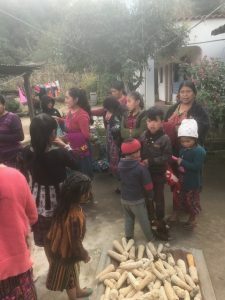 In four years, the group had together collected US$3,800 dollars, half of it was currently being used as small loans to the group members. This group also had an agreement that each week they would each save Q5.00 (65 cents) and contribute Q1.00 (13 cents) to the groups’ Social Fund. The Social Fund emerged as an idea for the members to use to celebrate their birthdays, or in cases when someone was sick, that member would receive support from the Social Fund. When the group ended the financial transaction part of their meeting, it was time for collective learning and reflection. Juana, who was assigned to facilitate that week, organized this part with an exercise to discuss women’s self-esteem and a conversation for the group to reflect on each other’s participation. As the group reflection started, one group member told another how they noticed she had been missed several meetings. She asked her why she couldn’t commit to coming to the weekly meeting. 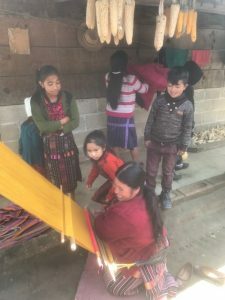 She replied, “I haven’t been coming because I have extra activities at the church, and can’t make the meetings at times,” as was translated for me from K’iche to Spanish by María, an ADEMI staff. 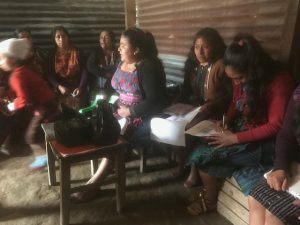 Several women then shared comments, and María summarized that the women were sharing that church activities happens on the weekends and not during the weekly meeting. They also mentioned that the women about whom the inquiry had been made received a small loan that day, even though she hadn’t been showing up to the meetings. Another round of conversation ensued, and after a lengthy deliberation, the group finally made an agreement that in the future, members need to be in good standing, meaning they need to attend the meetings regularly, in order to be able to receive a small loan. I witnessed how the women shared their observations, facilitated an inquiry and reflection about a member not showing up, and discussed a solution and mutual agreement so this would not happen again. It was a whole process, which needed to take its time with all members invited to give input. Time was dedicated to this process by Las Artesanas because of the value of mutual accountability. This collectivity was indispensable given the group’s goal of saving, sharing, and investing the money in each other. All this can happen when people trust each other.